Utility Room: With washing machine, free standing fridge/ freezer, and a pantry with shelving and quarry tiling to floor. 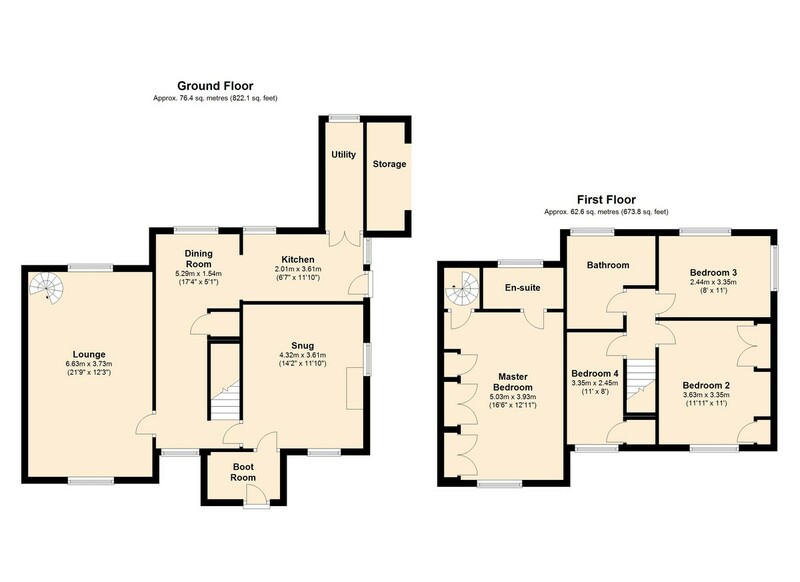 En-Suite: Three piece suite with separate tiled shower cubicle and basin inset to vanity unit. Bedroom 2: Double room with front and side aspect windows and seating area where one can overlook manicured gardens and far reaching views. Feature stone wall with pretty inset fireplace, wood panelling, exposed beams and wooden flooring. There is also a built in single wardrobe with shelving. Bedroom 3: Double room with front aspect window, lovely exposed beams, wooden flooring, built in single wardrobe with shelving and access to loft. Bedroom 4: Double room with double aspect windows to side and rear with pretty woodland views and wood flooring. Bathroom: Three piece suite with wooden step up surround housing sunken bath, window to rear aspect and towel rail. Garden: Truly beautiful gardens with many established shrubs and flowers with plum, apple and pear trees. In addition, there is an open fronted timber built Garden Room with timber flooring and tiled roof and open fronted "Man Cave" with further storage. There is a pretty raised Lily pond, a patio, various lawn areas, raised vegetable beds, open fronted timber garage, gravelled parking area and detached workshop/ studio. LOCATION Nestling in the lovely and thriving village of Lydbrook, Yew Tree Cottage is within the Wye Valley Area of Outstanding Natural Beauty and offers a superb location from which to enjoy the River Wye. As well as offering access to the surrounding countryside, the property also has village stores, primary school and a doctor's surgery within one mile. The market town of Ross-on-Wye is six miles away, offering a wide range of amenities and excellent road links via the M50 motorway. Select an option for more information. Representative example A mortgage of £202,784 payable over 23 years, initially on a fixed rate until 30/09/19 at 1.30% and then on a variable rate of 3.89% for the remaining 21 years would require 26 payments of £850.04 and 250 payments of £1,086.74. The total amount payable would be £294,896 made up of the loan amount plus interest (£91,002) and fees (£1,110). The overall cost for comparison is 3.5% APRC representative. *The monthly payment is based on an repayment mortgage where the amount borrowed is equal to the % of the purchase price shown in the LTV column. The GPEA Mortgage Service is provided by London & Country, the UK's leading fee-free mortgage broker. Their expert mortgage advisers will recommend the best mortgage to suit your personal circumstances and you'll have help managing your mortgage from start to finish. Whether you're a first time buyer looking to get on the property ladder, a home mover, a landlord buying property to let or an existing borrower looking to remortgage your current deal, their advisers are available to help you 7 days a week. The actual rate available will depend upon your circumstances. Please ask for a personalised illustration. Your home or property may be repossessed if you do not keep up repayments on your mortgage. The FCA does not regulate most buy to let mortgages. Thank You. We've received your message and we will get back to you shortly. Sorry. There was a problem sending the message. Please try again later, or speak to an advisor on 0844 8588 006. I/we expressly consent to be contacted without prior notice or arrangement using the contact details I/we have provided on the form and further consent that such contact may be in relation to (a) my mortgage arrangements and/or (b) other products and services. Hamilton Stiller was established in 2008 when the rental market was extremely competiteve. Both Directors have many years experience within the residential sales and rental property sectors and with their experience of buying, selling, developing and renting property they are able to provide a first class service to their clients.